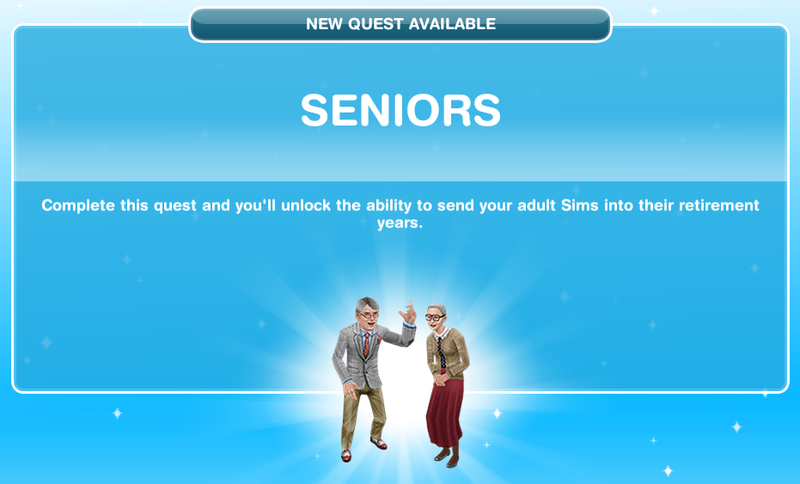 Seniors: Unlocked at Level 23 to unlock the ability to age Adult Sims into Senior Sims. This quest-line is time-limited, if you finish within the given time of 4 days you'll receive the reward. If you do not finish the quest on time, you still have access to making Seniors. Please note that the times for certain objects may vary, they depend on the quality (star level). (Last verified with the Glitz and Glam update, Sept. 2015). (Your Sim is TOO YOUNG to feed the pigeons? B.. but.... that doesn’t make sense! ‘Adult’ is the maximum age of Sims. They don’t get any older than that! (Who’s that? Hang on... is that... YOUR SIM? From the FUTURE?! ! (Oops... time travel must create a static build-up. Sorry about that. (Your Sim’s future self says they have travelled back in time because they regret not living life to the fullest while they were young. They want you to help fix their past. Oh, and a seagull is going to eat a cupcake, grow into a giant mutant seagull called GULLZILLA and enslave Simanity. (Uh-oh... your Sim just ate the cupcake! Oh well, what’s the worst that could happen? (Eww! ...And ouch! Okay, so the worst that could happen is that you get food poisoning and struck by lightning. (Your future self has some fancy moves! Not! Now that Sim Planet isn’t going to be taken over by a giant bird, it’s time to get back to correcting some of your future self’s regrets. (Your Sim’s future self says they’ve always regretted how they never went Ice Skating while they were still young. Instead your Sim has lived a life of gardening, gardening and more gardening. Your Sim needs to live on the edge, starting now! (Now that you’re here, it’s time to go ICE SKATING! Best do it properly though! Tap the ice rink and select 'Figure Skating' to skate the day away! (Senior Sims of the future are bored because they have nowhere to play bingo. Let’s fix this problem and give Senior Sims somewhere fun to spend their time... while surrounded by wild jungle cats! If that doesn’t alleviate their boredom, nothing will. (Your Sim’s future self says that today is known in the future as ‘Sim Town’s Perfect Day’. Apparently everyone in the future looks back on this day and talks about how ridiculously perfect the weather was. Well if it’s THAT good you should probably enjoy it! 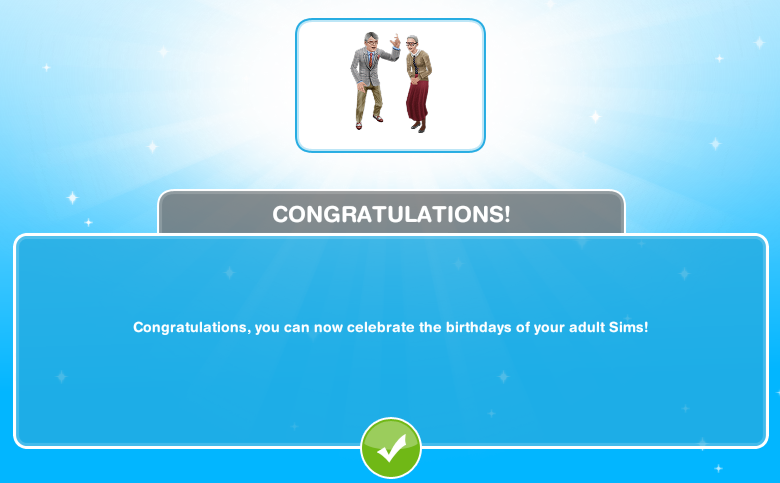 Congratulations, you can now celebrate the birthdays of your adult Sims! 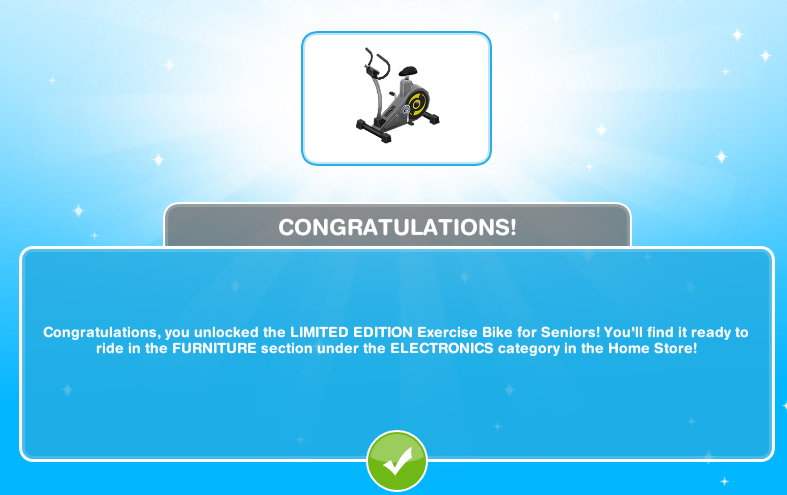 Congratulations, you unlocked the LIMITED EDITION Exercise Bike for Seniors! You'll find it ready to ride in the FURNITURE section under the ELECTRONICS category in the Home Store!